When we are back home in Hawaii, we eat comfort food for cheap at L&L Drive-Inn or Loco Moco. But our best friends wanted to treat us to something a little more “gourmet” and took us to Side Street Inn on Kapahulu Avenue near Waikiki. That restaurant is always packed with people for good reason. The food is filling and tastes so ‘ono! We all ordered different dishes to share but had to double-up on the fried rice because our group can consume it quickly! 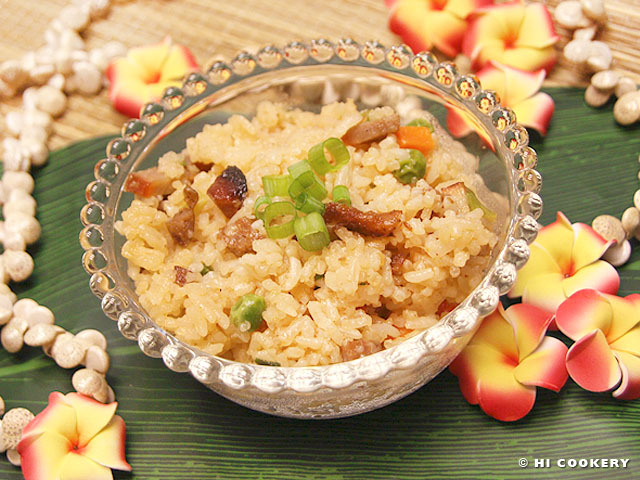 Rice is a staple in Hawaii where the food is influenced from Asia and the Pacific Rim. Like Hawaii’s cuisine, fried rice is a mixture of many cultures. Side Street Inn’s fried rice features Portuguese sausage, Chinese barbecued pork (char siu) and Japanese seasoning. Rice is usually served as a side dish but when fried with a variety of vegetables and meat, it becomes a main entrée. 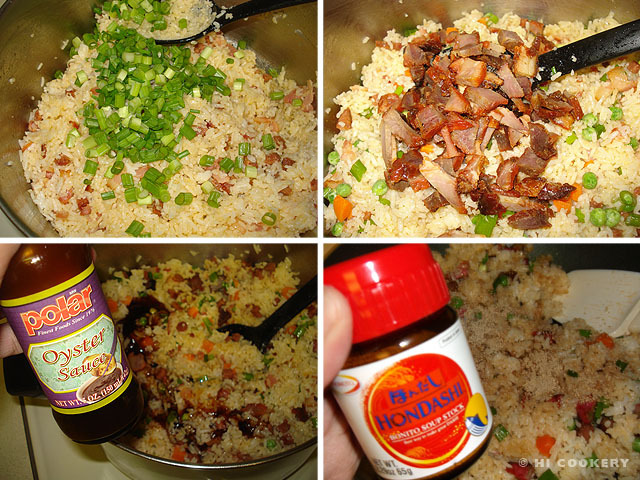 For National Rice Month, cook some comfort food like the locals do and make Side Street Inn fried rice. Refrigerate the cooked rice overnight to remove moisture. When ready to fry it, remove from the refrigerator and loosen up the kernels. Dice the Portuguese sausage. 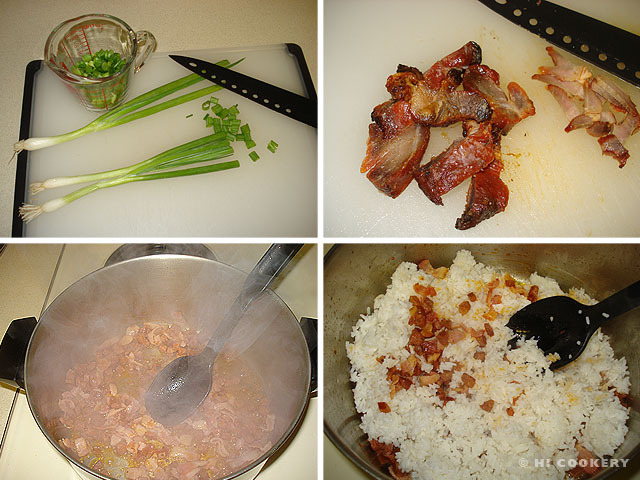 Chop the bacon, green onions and char siu. In a large pot/pan/skillet, saute the Portuguese sausage and bacon until cooked through. 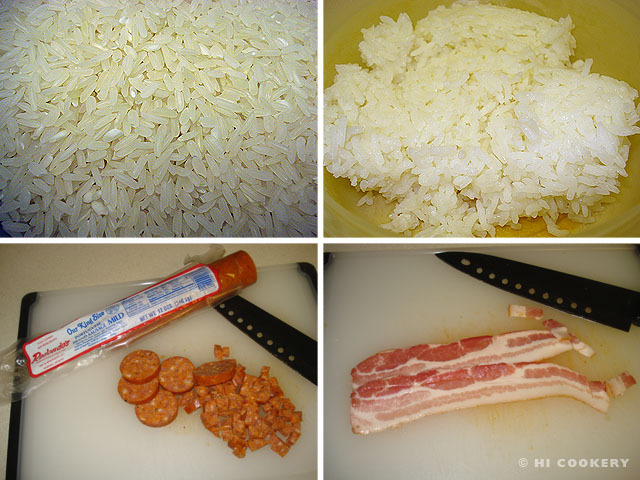 Add rice and mix well. Stir in the green onions. Add the char siu and peas and carrots. Season with oyster sauce, salt and hon dashi. Mix well. Transfer to a platter. Garnish with extra chopped green onions. Day-old rice that has been refrigerated is best for fried rice dishes. Although the Side Street Inn chef says that hon dashi is what adds flavor to the recipe, we eliminated the salt and lessened the oyster sauce so that the seasonings would not taste too overpowering. Hon dashi is available at most Asian grocery stores and markets. I stumbled upon your blog while looking for a haupia recipe and it makes me miss all the ono food in Hawaii. I now live in California and the fried rice here just isn’t the same. This recipe looks more like how I remember fried rice.